It lifts you up. It gets its way. It doesn’t want to be understood but it wants to say something. It wants you to like it. It’s not necessary to understand a work to like it. Or to agree on what that truth is. I am a poet, and because of my relationship to words there is, perhaps, always a personal attraction to visual works that incorporate words, or what seems like writing — visual works that invite conversations with their written elements, however liminal. I think what draws me to “Bird Lives” — and what draws me to Mark’s work — is the artist’s relationship or non-relationship to the figure, the relationship or non-relationship to the written word. The juxtaposition with negation, darkness even. I wonder about the artist on a personal level and the amount of personal erasure that exists in each piece. Encountering Raymond Saunders’ work for the first time through erica: I am reminded of Joseph Beuys’ blackboard sketches and their simple, concept-driven immediacy. I have memories of being in a classroom with a particularly animated and beloved teacher who would frantically jot notes, drawings and scribbled equations, connecting them with arrows or other markings in an inspired, and often wonderfully flawed, attempt to convey the subject. I was fascinated by the spectacle of such a (hyper) active mind at work, and mesmerized by the blackboard itself, by the ACT of writing a thought-process. It’s this almost desperate fervor to GET THE CONCEPT DOWN that I see in “Bird Lives.” I see its connections to the New York School poets and the Abstract Expressionists of the ’50s and ’60s, and, more expansively, later, to Jean-Michel Basquiat, whose graffiti-inspired neo-expressionist and primitivist paintings and commentaries on the black condition in America were popular in the ’70s and ’80s. The naïve lines and blunt symbolism in “Bird Lives” recalls many artists and works that were burgeoning on the Lower East Side of New York in the late ’70s when, through admixtures of poetry, drawing, and painting, artists and writers and punk and hip hop musicians inspired and drew inspiration from one another. 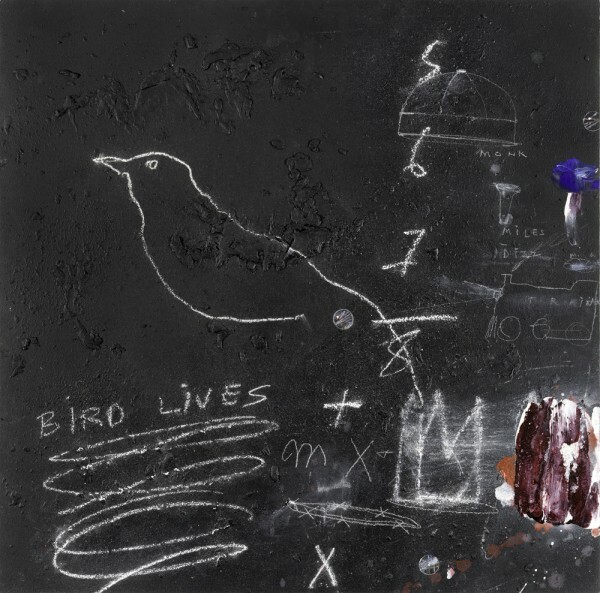 The commentary “Bird Lives” — perhaps mimicking ubiquitous “Jesus Lives” or even “Clapton Is God” graffiti — references the great bebop saxophonist Charlie Parker with whimsical doodles of crowns and simple non-arithmetic (5+6+7= 8), alluding perhaps to a purely subjective mathematical theorem that in fact “The Bird” is King. Long Live the King! This hodge-podge, these disparate elements telling a story by virtue of juxtaposition. Raymond Saunders’ work seems to share an affinity with the first wave of New York School writers. The New York School poets not only found inspiration in each other, but also from the Abstract Expressionists (or Action Painters), including Jackson Pollock, Willem and Elaine de Kooning, Larry Rivers, Robert Rauschenberg, Cy Twombly, and Fairfield Porter. There was a general sense of playfulness and chattiness in their works; elements of the mundane as well as the surreal, the childlike and the profane — all seemingly thrown together: sketches, bits of painting, jotted down phrases, shreds of cloth, found objects. These strange juxtapositions employed a lyrical, improvisational quality akin to the avant-garde jazz movement, bebop. The use of humor and inclusion of elements found in pop culture and the everyday were drawn directly from the musical lyricism, improvisation, and multicultural appropriation of jazz and jazz language. All this coalesced into a new language: a bop prosody, based in a new artistic and grammatical sensibility less reliant on formal, classical, or modernist structure, focusing on directly capturing the mood of a specific moment. “Bird Lives” spoke to me initially because of its darkness, but also because it captured the mood of our specific moment. Playing in layers of darkness. The seeming commentary on black culture and culture at large. The relationship that I have with words and order come into stark contrast with this work. And Charlie Parker. How he lived. How he still lives, is alive and celebrated, through his music, his critique of culture — in fact re-working of culture — is just as subversive, just as stark and driven by narrative. A collaborative darkness. Falling in love, as a child of eight, with da Vinci, Michelangelo and Rembrandt, which led to incessant drawing. Taking a course in the “Old Master’s Painting Technique,” at 16 — a technique which involves doing a white drawing on a dark background and repeating this process over and over with layers of color washes. Being introduced to the work of Wassily Kandinsky. This produced a fundamental shift in how I viewed and understood modern painting. The realization that although I might not actually LIKE Picasso, his almost genetic understanding of art history and mastery of numerous creative processes was virtually unparalleled, and that it was possible to be the consummate genius of one’s era. The moment I saw my first Basquiat and experienced 40 years of art and social history in one painting: I cried. Seeing a Joseph Beuys retrospective in the ’90s in Germany; a world I had barely known existed was revealed to me. When erica asked me to do some drawings for a book she was writing. I had a bad case of the flu and in my feverish and mildly hallucinatory state I read her work and produced my first purely abstract group of drawings. A paradigm shift. Without this basis, Raymond Saunders’ deceptively complex work might have appeared simplistic, even naïve, and thus lost on me. The painting may look like random, quick doodles to some observers, but they are a lifetime in the making. I feel the immense gravity of that history when I look at it. I came into contact with this work at a very turbulent and disturbing time in this country. Recent events, including the failure to indict in the deaths of Michael Brown and Eric Garner, a renewed focus on police violence, and violence against the police as retribution for the failed indictments, had resulted in protests and die-ins staged all across the United States, including Saunders’ hometown of Oakland. Looking into the darkness of the canvas, of the world around me, I came to see and identify this painting in terms of the slogan/call to action “Black Lives Matter”: bird lives matter. This all weighed heavily on my mind as I visited and re-visited this painting, struggling to make sense of it while struggling to make sense of the world around me, and how this, all of this, was seeping into my own creative work as I tried to finish work on poems that recount my family’s own complex history with race and culture in America. The conflation of personal and past and present. Cataloging darkness. A digging in of our deepest collective dirt; our darkness reflected back at us. Saunders’ mixed media work invites a social/racial dialogue. His pervasive use of black as a base color is not only visually and thematically striking, but seems to directly refer to his own essay, “Black Is A Color” (1967), in which the artist argued against the prevailing symbolic, metaphorical, and thematic use of black as representing nothingness: as lack of color, as lack of light and life and soul. In this respect, Saunders’ work has a timeless yet of-this-moment feel that speaks to us all in this supposedly “post-racial America,” asking us to consider its possibilities. In this, Saunders shares a striking similarity to Jean-Michel Basquiat, whose expressionistic and primitivist paintings ironically belied a highly evolved, abstract thought and creative process and superior technique. However, where Basquiat was content to riff off of the inherently racist concept of the African-American-as-noble-savage with aggressive humor and at times downright brutal sarcasm, Saunders’ work exhibits a more refined spirituality and careful consideration of the many, often conflicting, elements making up the collage of contemporary life. It doesn’t add up, but it does. erica lewis lives in San Francisco where she is a fine arts publicist and curates the john oates house reading series. Her work has appeared in various anthologies and journals. Books include the precipice of jupiter (Queue Books) and camera obscura (BlazeVox Books), both collaborations with artist Mark Stephen Finein, and the solo project murmur in the inventory (Shearsman Books). A double chap is forthcoming from Lame House Press in fall 2015 and a chapbook is forthcoming in spring 2015 from Ypolita. She was born in Cincinnati, Ohio. Mark Stephen Finein earned his BFA in Printmaking from State University College Buffalo. Over the years, his creative focus has shifted to include music composition and performance. A few years of world travel led him to San Francisco where he’s been since 1994. Book projects include the precipice of jupiter (collaboration with poet erica lewis, Queue books) and camera obscura (collaboration with poet erica lewis, BlazeVox Books); his work can also be seen in Little Red Leaves and Boog City, among others.